Do you wish to share some important news with dear ones? Do you want to do so in a really memorable way? If yes, Tiny Prints can help you do just that with specially designed announcements and invitations. Tiny Prints understands the value of such occasions and ensures the best-quality paper is used for its entire product range. This thick, eco-friendly paper is custom made in Italy and premium printing methods allow customers to personalize their materials just the way they want them. Available products include holiday cards (for every major festivity, from New Year's Day to Christmas), birthday invitations, business cards, birth announcements, personal stationery, and more. 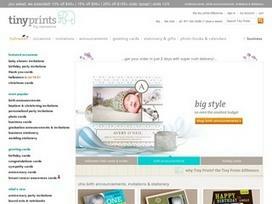 The Tiny Prints website has been designed to help customers find the perfect cards, invitations, and stationery to fit their needs. Each week, exclusive items are added to the online store, including new selections of stationery from the top artists in the field. With an extensive selection, high-quality customer service, and fast delivery times, 100-percent satisfaction is guaranteed for every order. A team of professional designers will give your materials the personal attention needed to make sure everything about your product is flawless. If there is anything wrong with your cards, Tiny Prints will gladly reprint them. Once you choose a design you like, you can personalize it with photos and text. If you wish for specialized assistance, you can pay for the personal shopper service and Tiny Prints designers will select the perfect designs for you. Whether you are in need of thank-you cards, moving announcements, birthday cards, or wedding stationery, there is a plethora of creative possibilities at your disposal. Once you have finished your order, the product will go through up to four rounds of quality review to ensure photos are aligned properly, text is spelled correctly, and colors are printed out crisp and clear. And if you buy stamps and add the company's free mailing service to your order, Tiny Prints will stamp, seal, and mail your cards for you! Everything you can purchase at Tiny Prints is arranged to help you find not only cards, invitations, announcements, and stationery, but also photo books, address labels, stamps, embossers, and custom keepsakes. Your photo card can easily be turned into a canvas, a framed photo, an easel art piece, or a mounted print. And if you sign up with Tiny Prints, you can receive updates for interesting offers, as well as opportunities to collect special coupons for free gifts. With the help of Tiny Prints, announcements for births, graduations, engagements, and weddings can all be created and treasured, bringing eventful occasions to customers' memories for years to come. Share what you think about Tiny Prints, and your favorite ways to save there! I always get compliments when I send cards from Tiny Prints. Thanks for offering such good deals on their products.